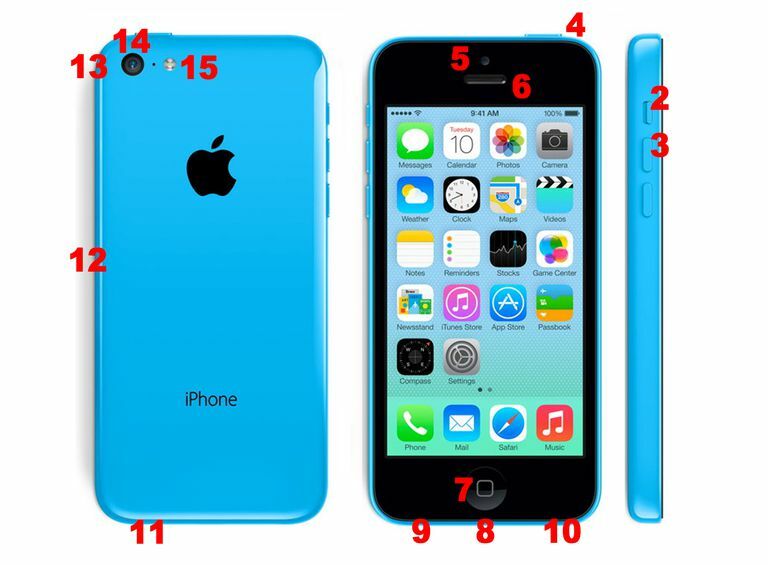 With its bright colors, the iPhone 5C looks different than any previous iPhone. From the outside, that's correct, but on the inside the 5C isn't really that different than the previous-generation model, the iPhone 5. Whether you've upgraded to the 5C from a prior model, or are enjoying your first iPhone, use this diagram to understand what everything on the phone does. Antennas (not pictured): There are two antennas used on the 5C to connect to cellular networks. Two antennas instead of one are used to increase the reliability of the 5C's connections. That said, you won't be able to tell that these are distinct antennas — or even see them: they're hidden by the 5C's case. Ringer/Mute Switch: Silence phone calls and alerts using this small button on the side of the 5C. Toggling it can turn off audio for alerts and ringtones. Volume Buttons: Raise or lower the volume of calls, music, alerts, and other audio on the 5C using these buttons on the side of the phone. Hold Button: This button on the top edge of the iPhone gets called a lot of things: sleep/wake, on/off, hold. Press it to put the iPhone to sleep or wake it up; hold it down a few seconds to get a slider onscreen that lets you turn the phone off; when the phone is off, hold the button down to turn it on. If your 5C is frozen, or you want to take a screenshot, the Hold button (and the Home button) can help. Front Camera: Like other recent iPhones, the 5C has two cameras, one of the front of the device facing the user. This user-facing camera is primarily for FaceTime video calls (and selfies!). It records video at 720p HD and takes 1.2-megapixel photos. Speaker: When you hold the 5C up to your head for a phone call, this is where the audio from the call comes out. Home Button: Click it once to bring you to the home screen from any app. Clicking twice brings up the multitasking options and lets you kill apps. It also plays a role in taking screenshots, using Siri and restarting the iPhone. Lightning Connector: The small port at the center of the bottom of your iPhone is used for syncing it to a computer and connecting it to accessories like speakers. Older accessories used a different port, so they'll need adapters. Headphone Jack: Headphones for phone calls or to listen to music get plugged in here. A few types of accessories, particular cassette adapters for car stereos, are also connected here. Speaker: One of the two mesh-covered openings at the bottom of the iPhone is a speaker that plays music, speakerphone calls, and alerts. Microphone: The second mesh-covered opening on the 5C is a microphone used for phone calls. SIM Card: You'll find this thin slot on the iPhone's side. It holds the SIM, or subscriber identity module, card. A SIM Card identifies your phone to cellular networks and stores crucial information like your phone number. You need a working SIM card to make calls or use 4G networks. Like the iPhone 5S, the 5C uses the smaller nanoSIM card. Back Camera: The 5C's back camera is higher-quality than the user-facing camera. It captures 8-megapixel images and 1080p HD video. Back Microphone: Capture audio when you're recording video using this microphone near the back camera and the flash. Camera Flash: Take better low-light pictures by using the camera flash on the back of the iPhone 5C. 4G LTE Chip (not pictured): Just like the 5S and 5, the iPhone 5C offers 4G LTE cellular networking for speedy wireless connections and high-quality calls.